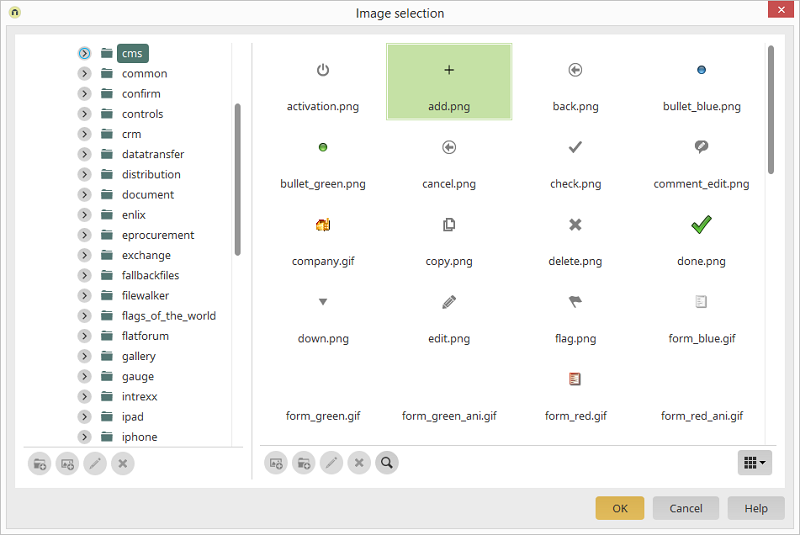 Any image that is added to the Application images / Layout images folder is directly saved in an individual directory for the application or layout, respectively. These images can solely be used in the current application or layout, respectively. Images from the Intrexx image family can be selected here. Click on the arrow symbol to display subordinate folders. Images and folders from the Intrexx image family cannot be edited. A new image can be selected from a directory here. Here, the name of the highlighted object (image, folder) can be modified. Displays the original of the highlighted image in a separate window. By using the icon at the bottom right, the image list can be depicted in the displays "Simple", "List", "Symbol" and "Details".